It’s been more than a year since I shared our reasons for relocating to Ecuador, some of them cultural, some economic, some climatic. Since then we’ve been tossed, expat heads over the lowest of heels, not in some far flung corner of the Amazon, not in some global outback where we struggle to survive, but in the lovely town of Cuenca, high in the Andes, where the weather is spring-like year round and the colonial city center is an UNESCO World Heritage Site. We’ve been more than pleased. A year ago I shared, as well, our ethical reasons for leaving the US. I explained that in America, it’s too easy to become comfortable and lapse into a complacency that takes privilege for granted. I said that in America, we whine when it’s too hot or cold outside, that we complain when a grocery store doesn’t stock the brand of bacon or napkins we prefer. I still feel that way. All too often in the US, we’re pampered by convenience, sometimes even spoiled by ready-made and pre-packaged. Assuming the biggest and best are owed to us, we’re, not only content to take it easy, but we also develop a sense of entitlement that most of the developing world hasn’t. In the US, we’re insulated by oceans on either side, reap the benefits of Canadian wealth to the north, and complain when the poor from Mexico cross our southern border in search of a living wage. We are the sometimes spoiled younger sibling of a, now, global family. Why should we adopt the Kyoto protocol if it requires sacrifice on our part? Do we care enough that climate change impacts the poorest of poor more that it does us? Those people and places are far removed from our experience, one that’s defined more by cable TV and video games than hunger, poverty, disease, or need. Last year, I said, there’s nothing wrong with episodes of “Modern Family,” for example, but when we watch games like “Survivor” on “reality” television, because we don’t know the real experience of struggle, it seems we’ve gone too far. It seems, at least to me, that something fundamental is amiss. You only have to read or see The Hunger Games to understand that utopia too quickly collapses in dystopian nightmare. How far is “Survivor” from the game Katniss is forced to play? A year ago I lamented our American inclination to reduce survival to televised game-paying. I said it seemed obscene to me–especially in light of the actual agony lived by so many mothers who struggle to feed their family even one meager meal a day. Sometimes I still think about the year we lived in Haiti, the year after an earthquake leveled most of that country’s capital. I hate how easy it is to forget. 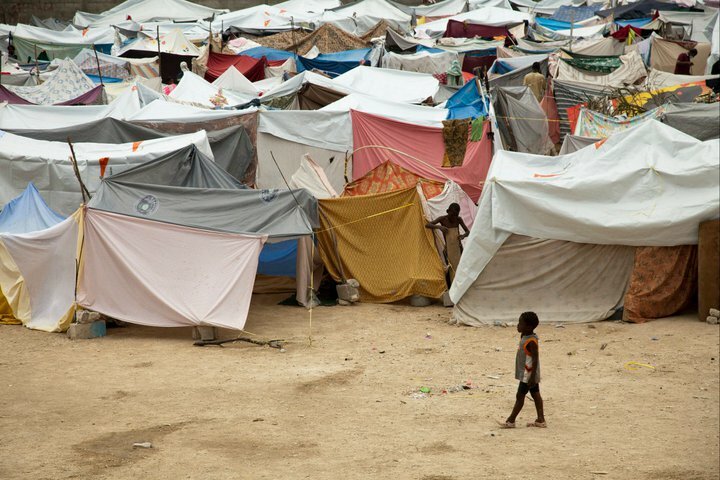 I hate that I have only distant and fading memory of the post-earthquake devastation—the newly homeless tented and tarped across the hillsides of Port-au-Prince. I still think about Haiti during the rainy season, the night-time torrents of wet, the damp dark that soaks the soul of a person. I think about a mother, holding her baby, in a make shift tent—barely a tarp over a mud slick floor. A year later, I’m still glad we’ve begun to change the lie we lived–the double standard that says I care but then does nothing or not enough. Sara and I simply didn’t want to live this way any longer. We wanted to know the world the way it really is–for most people. This choice, this challenge, this elbow-deep digging in soil and sweat, isn’t the life for everyone, but it’s been the right life for us–and one the US has given us the privilege to choose. Unlike so much of the world, we, at least, have the education and income to make a choice. –living what we value, behaving as we believe. Are you, like me, spoiled by living in a wealthy country? Do you take that privilege for granted? How do you live your values? This entry was posted in American values, Ecuador, moving and tagged American values, Cuenca, culture, Ecuador, expat living, expats, Haiti earthquake, inspiration, international living, life, moving, values. Bookmark the permalink. I probably am spoiled by living in a wealthy country, but I do appreciate the lucky, privileged life I have lead. I have not always been wealthy, I was a very young single mother and went without so that I could stay at home and look after my little boy. Even so, it was not really a hardship when you consider how many mothers struggle to care for their children. Top marks to you both for for you move to your new life. Thanks, Debra. I think there are a lot of reasons why folks move to another country. Personally, I have NEVER been wealthy. In fact, we are far from that. I’m always eager to know why folks do it, especially if not for a job. Glad the post spoke to you. Great to hear from you. Have a wonderful week, my friend. The impact of a society with a divisive population (English vs French speaking)- and it has not been comfortable. I think we’re all better off in the end. And I’m now bald. I pity you the hair loss. I hear they sell some great wigs here in Ecuador, should a visit here be somewhere in your future. I bet Offspring #2 would love the Galapagos. I swear, if I had kids, I would feel the way you do. Nothing like living away from home to teach awareness. I can only imagine what the Japan earthquake taught them. I find myself spoiled and someways and not so much in other ways. Certain things I take for granted and other things not so much. I am grateful to you for writing this thoughtful post. I’m glad this one spoke to you, Robert. It’s wonderful to hear from you this morning. What kinds of things do you tend to take for granted? I suspect it’s different for everyone. Take care, my friend. And congrats on the warm-up. Thanks so much, Jennifer. Glad you appreciated the post. As someone who has spent a good bit of time away from your home in Canada, your reasons for living abroad would be interesting to me. I think different things motivate everyone. What has motivated you? Thanks for sharing your wonderful perspective. Too realize how get one has it, one important factor is experiencing less …. and your life experiences have given you that. Cheers to your outlook! Thanks to YOU, Frank. Somehow I missed your comment earlier. Glad you can appreciate the perspective. We really do have it good, and we are grateful that we have the means and education that allow us to make this choice. Great to hear from you, Frank. Congrats on the warm-up and happy packing! Gosh, isn’t that the truth, Juan. The sky IS the limit! I wish more American’s understood more about the glorious adventures that await them, if only they would step outside their comfort zone. However, it’s not just Americans I wish that for. I suppose, I wish it for everyone living in the first world. Great to hear from you, my friend. See you all tomorrow! You and David are our greatest discovery in Cuenca, by the way. Thank God for good friends! Kathy, I am thrilled to have discovered your blog through a comment you made on Thirdeye Mom’s blog. My husband and I, who are originally from the Pittsburgh area ( yes, I read with interest your articles about your dad), now live on Ometepe Island in Nicaragua. We are often asked why we left the states, but I find it hard to answer. We consider ourselves to be economic refuges…too poor to have been able to retire early from our teaching jobs and live a comfortable, yet simple lifestyle in the states. Yet, more than that…we wanted adventure, stimulation, and challenge. We wanted to become immersed in a new culture until it floated out of our eyeballs. We wanted to live our dreams of becoming citizens of the world, instead of living within confining borders that determine who we are, what we can do, and how we can live. Our perceptions have changed drastically. We are living with new eyes without borders. Every morning, there is a new day awaiting us, prodding us, challenging us. We live with dirt embedded under our fingernails, cow manure and chicken poop stuck to the bottom of our flip-flops, and an active volcano in our backyard that could erupt at any time. We’ve jumped and we couldn’t be happier. Thanks so much for your blog. I love it. Oh, I can’t thank you enough for your comment! It’s wonderful to hear from you this morning. Your life in Nicaragua sounds amazing. Love your flip-flop description the best. And how fun that you are from Pittsburgh. I saw I had a number of hits on my blog from Nicaragua yesterday and wondered who had been visiting. How wonderful, also, to read what motivated you to leave your lives in the US. I imagine Sara and I are economic refugees in a way, also. We moved largely so we didn’t have to make decisions based on economic factors, and the outcome has been incredibly freeing. Can’t wait to visit your blog! Heading there as soon as I respond to these comments. GREAT to hear from you. All through the reading of this blog, I thought why did they go all the way to another country when our own country is experiencing much of the same type of depression, you just have to look a little more. I understand your concern and your desire to assist and not take the privileges that we are given in the US. I think I have more to ask about this? I am not sure the is the place to do so? Great question, Jeff. One of the reasons we chose to leave the US had to do with our inability to afford living there. We could never have paid to heat our home in Lexington this winter. Here we are able to make decisions that are not economically based, but value based. It is SO incredibly freeing. Plus, we have been able to do things for our families that could not have done otherwise, like host my nephew here for 6 months. He gets to have an incredible international experience, one we could not have offered him were we living in the US and unable to heat our own home. Feel free to ask questions. I’m happy to answer. Great to hear from you today, my friend. Hugs and love to you, too, dear Jeff! When I am grumpy I like to challenge people! You so met that challenge. I understand completely your process and purpose. For I was thinking the same thing when my Life here transitions into a more freeing experience. Thanks, Jeff. I hope you experience some freedom soon. You are doing a good thing, my friend. Hugs from Ecuador from both of us. Grumpy or not, they were great and, frankly, very valid questions. Hope your afternoon is better than your morning. Hi Kathy….it’s really David this time. What a beautiful piece! One of the things that appealed to me the most about Ecuador is to see how happy the people are. How can there be so much happiness if they don’t have the biggest TV or the newest car or the latest PlayStation etc. etc. etc. God Forbid, sometimes the Internet stops working. In The US, we are brainwashed into believing “stuff” is the key to happiness. When a lot of times the key to happiness for the rest of the world is a hot meal for your hungry child! Your writing inspires me! Oh, David, thank you for your comment. Thank you SO much. I can’t tell you how humbled I feel that I could inspire anyone. That is such a dear thing to hear. Yes, we are so motivated by belongings in the US. I still feel some remnants of that in myself, but I feel freer from it the longer we are here. It feels so, good begin redefining those values and actually living them. Hugs to you and Juan from both of us. Can’t wait for our beach adventure! i dubbed my little studio along the quiet stream \(in costa rica\) ‘walden,’ and through the whisperings of the wind in the towering tree, the howler monkeys in the branches, and immersion in the wild, i slowly negated the areas of my psyche that needed work – or awakened more of my true self. we stop growing when things are comfortable and routine. i now embrace my life and the obstacles in my path.. well, that excavator and those dump trucks of beach sand are hard to embrace, but apathy is wrong, and someone has to sound the alarm. I had no idea you had been away from the US for so many years. Wow! Fascinating to hear that. I agree that too much comfort causes us to stagnate. I notice that I’m feeling freer and freer, the longer we are here–more able to challenge myself and my beliefs about what I’m entitled to. I still hate my own sense of entitlement. I wish we were closer, too. However, we just decided we are going to the beach at the end of March-not as far north as you are, but between Salinas and Montanita. Don’t know if that would be close enough for you to visit while we are there. Will be there for my birthday, from the 25th to the 28th. how fun.. i´ll be with a group on the 21, 22, 23, and i might leave for the usa soon after that.. depends on what the rain is doing ‘ or not doing.. it would be great to see you ‘ montanita is probably about 12 hours from jama via bus. Gosh, I didn’t realize it was that far. I suppose we won’t be seeing you soon then. However, it looks like we might not make the trip them anyway, as we were given a bait and switch from the travel agency. We are still looking at our options. Great to hear from you, Lisa! Very spoiled and while I am sure we are appreciative for what we have, I am also pretty sure we are clueless. I was astonished that we knew so little about Haiti until the earthquake and I continued to be astonished when Cole wrote a report on the geography on Haiti this year. Beautiful country, and unrelenting. Will digging for oil help–yes, but at what long range cost and yet the more practical side of me wonders if they afford the luxury of thinking long term and so I intend that they hang on tightly to those oil rights. I do what I can for the poor and improvised in the states (and yes I know our improvised can not begin to compare) and we stayed away from television for the first 12 years of my kids life completely because of complacence is not one of my values. I am very American and Apple Pie and not so liberal on the other hand your post did not make me the least bit defensive there is room for work on both sides of the world and perhaps someday the two shall meet on a more equitable level because of that work. But it takes all of us to make the world a richer place. This is not the life for everyone. You do your own part from your home in Chicago. I SO appreciate that Katybeth. Yes, we are pretty liberal, but, ironically, Sara and I are both the only liberals in either of our families, so we have huge respect for folks who come from other perspectives. We understand that perfectly reasonable people can disagree and still love one another. Thank you SOOOOOO much for your comment, my friend. It’s great to hear from you this morning. And your Cole is one amazing kid! What a great artist he is! Thanks for your thoughts. It is, after all, the motivation for the move that gives rise to the content of the experience. For me, I’ve lived and worked my entire life in the United States. As an attorney, I’ve met many people expressing every imaginable perspective. But, my wife and I prefer to not stop this life we have and shift into one that we already have because it’s comfortable when I retire. We in the U.S. feel so privileged and so detached from the rest of the world. Our news is written, as if, we are the center of the universe. It’s in our travels that I have felt renewed and charged. I have always appreciated the perspectives of those that don’t feel as if they were the “center of the universe”. When I first visited Ecuador in the 70’s I knew I liked the people and the raw beauty of it all. During our last visit to Cuenca, it just felt like a good fit for us. I feel we have one more adventure in us before these vehicles are completely used up. But that’s my plan – to so completely use up this body and experience as much as I can before I leave it. And to me, that is doing something that is a little uncomfortable and raw – but real. Gosh, Bill, you have said something that is so wise and something I hadn’t actually considered. But, yes, the motivation does help determine the content and quality of the experience. Well said. I love also what you say about having one more good adventure left in you. We feel the same way–though we may still have time for two or three. Great to hear how you’ve enjoyed your encounters with Cuenca. Hope to meet you all once you make the move. Thanks so much for reading and taking the time to leave such a thoughtful comment. Hope you will visit my blog again soon. K, great posting as always. Thank you. Yes, everyone has their own reasons for doing lots of things. I went to college because I found science to be very interesting and wanted a career in science. Then I joined the US Army because I was poor and my daughter needed surgery that my insurance did not cover. A added benefit of being in the army was that in addition to free surgery for my daughter I was able to experience much of the world. I went back into science as a research ecologist so that I could make a difference in this world. That mostly worked but the US government does not care about the environment. Global warming is someone else’s problem. The attitude seems to be that our technology can fix it! The super rich can do whatever they want. They pretty well own the US government. The rest of us just try to get by. I totally agree with the comment about the garbage called ‘realty’ shows. Life in the US is no longer anything like reality. We are seriously considering a move to Ecuador. Fascinating comment, Bob. And it’s so interesting to hear about your thinking and to know you’re an ecologist. I have to agree with recent comments by important folks in the Obama administration that climate change is a weapon of mass destruction. We are destroying our planet. It’s tragic. And I imagine you understand the ins and outs of that in ways I can never hope to. How great also that you were able to join the military and get your daughter the surgery she needed. That was a smart move! Hope you will, indeed, consider a move to Ecuador. It’s an incredible country. Thanks so much for reading and taking the time to leave a comment. Hope you will visit my blog again soon! It’s wonderful to hear from you this morning. I admire you both so much, because you truly walk the walk not just talk the talk. I wish I had the courage to do what you’ve done. I am so sickened by attitudes in this country, and my own complacency. That has to change somehow. Thank you, Lisa. We try to walk the walk, but we stumble all the time. We are still figuring out our way. Plus, I think it takes time to make a decision the way we did. And you have Sarah to think about. You are amazingly courageous in my mind. You are always challenging yourself, Lisa, and I love that about you. Thank you SOOOO much for your comment, my friend. And we are still hoping you all will visit us sometime soon. Love and hugs to you, my friend. THANK YOU for sharing your journey with us. And for walking the talk! Like you, I live on purpose, bearing in mind the butterfly effect: every little thing I do has an effect somewhere. Hence, I’m positive, uplifting, constructive, and healing — intentionally. Yes, yes, you live more intentionally that almost anyone I’ve met on the blogosphere. You are such a valuable role model, Laurie. Thanks for reading. I love hearing from you! You are both role models for us spoiled, want-it-now—complacent Americans. But what about you, Kim? Gosh, YOU are a role model, as well. Look what you have made of a terrible tragedy–actually, a crime. Love to you too, my dear! Thank you, Kim. I love you, too. Oh, I can’t wait to read your post. I wish I were more of a humorist. In fact, you can say so much more when you are able to say in a way that entertains. Thanks so much for sharing the link. And thanks for stopping by. I hope you’ll visit again soon! I already know I’ll be back. Long time follower/lurker here. Oh, cool. I’m so glad to know you’ve been around. Thanks for leaving a comment! Kathy, I love your honesty. You and Sara are doing something I truly admire. Your actions speak volumes for who you are. We are making our regular trip to Sri Lanka and my children will be sure to experience the joy of not just embracing every aspect of their heritage, spending time with their grandmother, aunts and uncles, but seeing the other side of the world, seeing how joy is experienced in giving not taking. They are aware, because I remind them everyday, that life in the US is lived in a bubble of plenty, of material comforts and this notion that I want- I get. They don’t get often, but they see others getting and ask why. I grew up giving, not taking, it wasn’t a particularly wealthy home but I was privileged. My mom made sure we gave daily. This sense of entitlement is not how I want my children to grow up. I always tell them, I give you the world, make it count. I hope it works.. Thank you so much for your kind comment. I don’t know that we are doing anything all that extraordinary, as this kind of behavior comes rather naturally for us. I mean, I think it would mean more, if it were a more difficult choice for us, if that makes sense. Sara has lived all over the world, much more so than I. In fact, she has spent a lot of time in Sri Lanka. Still, thank you for suggesting we have made a good decision. I hope we have. Good for you, for the way you are raising your children and taking them to Sri Lanka to spend time with family and see another way of life. You are a wise mama! It’s wonderful to get your comment today. I loved hearing from you. Hope you have a good day! What interesting discussions you have engendered with this post…most people in the States don’t realize how spoiled they are…thus politicians keep getting their jobs back despite their performance…when I travel I see how the rest of the world lives and appreciated what I have even more. Yes, that is exactly what happens. And you communicate those values so well in your poems, Charlie. Sometimes they take my breath away with their insights. Great to hear from you today. Thanks for stopping by and have a great day! LOVED this post – it gave me goosebumps too. We found ourselves really struggling (and sometimes failing) to stay afloat financially. It was important to us that one of us was at home raising our kids while they were little, but that meant huge sacrifices as my husband had just retrained as a teacher. The catalyst was when I spent a year working evenings, weekends and school holidays in a nursing home, just so we could make ends meet. The fact that job was pretty much my only viable option at the time made us realise how small our lives and aspirations had become…so we scarpered and have never looked back. I am 100% spoiled now, no doubt about it. We now have all weekend and school holidays together, give or take the odd time when work does intrude, but it’s no longer 12-hour shifts on minimum wage. Those tight seven years at the start of our marriage were the making of all of us, but I’m damn glad we chose to try something different. Yes, yes, K! I have to agree that those struggle make us. Sometimes it hard to see another option when you’re in the middle of a situation, however. Thank god you did. And thank god you are staying home with your kids. I can’t imagine leaving mine, if I ever had any. If you are going to have children, it seems to me one parent or the other needs to spend time with them. And sometimes living the life of an expat is hard to beat. At least for us in Haiti and Vietnam, we didn’t have to pay for our housing, which is a huge savings. Great to hear from you today. Hope you all had a happy Valentine’s Day last week. Yes, the free housing is not to be sniffed at! This lovely film from Aeon dropped into my inbox last night and can you believe it’s about Chimborazo? I hadn’t heard of it until a few weeks ago and now it seems to be everywhere! OMG, Sara and I both watched the film. Goodness, that was incredible, and we had heard nothing about it. Thank you so much for sharing the link!!!!!!! Happy Thursday, Kirstin!!!! Yeah, I watched several films while there. They were stunning. Thanks again for the introduction. Thank you, JK! I know how you feel about these things. I remember 20 years ago thinking what a role model you were in this very regard. You, if anyone, have certainly walked the talk. Hugs to you! Oh, wow, I would LOVE to see more recent photos of Port-au-Prince. Thank you SO much for stopping by and leaving a comment. It’s great to hear from you. Where in PAP do you live? Please stop by again soon! We live close to the police station at the intersection of Clercine and Kenz Octobre in Tabarre. I will work on getting some photos to you and in the meantime continue to look forward to your writings. Thanks so much. 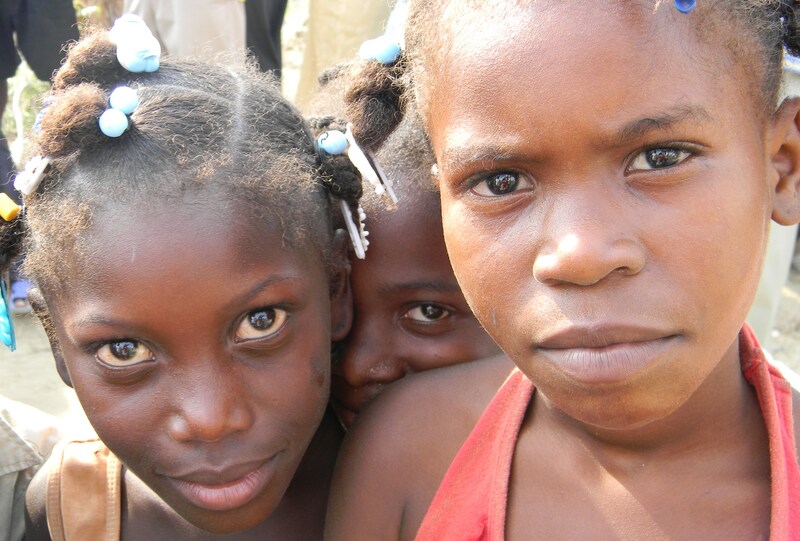 We lived in Petionville, as there were few other options immediately after the earthquake. Sara’s NGO, Habitat for Humanity International, got us housing there. Again, I really appreciate your stopping by. A good friend of mine says that to live a compassionate life you have to “look beyond the end of your hand.” It’s easy to have blinders on. It takes a lot of effort to expand your viewpoint because you have to step out of your comfort zone. You and Sara did that through her work and by moving to Cuenca. For me, it was moving to NYC. There is such disparity here between the haves and have nots. Yes, yes, coming from Tennessee, NYC would be a HUGE adjustment. I can only imagine, Jacki. We SO hope you will come and visit soon. Can’t tell you how much we’d love to have you. Any sense of when you might be able? Great to hear from you today. Heard you all had a warm-up. Congrats! And how about that guy who married us–cool video that V sent, wasn’t it?! No doubt I’m spoiled by living in a wealthy country, although we do live simply and below our means. I feel kind of lucky that my parents took my sister and me to live in Greece while we were teenagers, and sent us to an international high school. There we made friends with other students and learned from teachers from all different walks of life and from many varied cultures and countries. I even got to work in the soup kitchen of an Orthodox Church in Athens for a while. I didn’t appreciate it so much at the time, but the experience made me more humble and opened my heart. I don’t take anything for granted. No doubt that living in Greece would have a MASSIVE impact on a kid. And attending an international school would be SO enlightening. If I had kids, I would want to take my kids overseas, for the experience of an international education alone. And to have volunteered in a soup kitchen would have a huge impact on a child, even if you didn’t realize it then. I imagine that’s where your sense of compassion comes from, to some extent. Thanks so much for stopping by. It’s wonderful to hear from you today! Sorry. Just left you a long response and then lost it somehow. However, it’s wonderful to know that folks like you are considering coming here. One of the things that has been really fun, in addition to many others, has been the amazing friends we’ve made. I suppose it takes a special like of person to move to a place like Ecuador, but for the most part those who have tend to be really bright and creative adventurers who have made good friends. Please let me know when you come to visit, as we would LOVE to have coffee and share our experience with you! Thanks for stopping by and taking the time to leave a comment. Tricky question. Yes, I suppose anybody who lives here is in some part spoiled by the wealth of the country, but for many that at least comes as the result of hard work and a pursuit of the famed “American dream.” It’s nice that we at least have the chance to work hard and reap the rewards of that success. Sure, American consumerism can be annoying, but there are plenty who live within their means and do the “right” things like shop local, protect the environment, etc. Definitely a balancing act. With all that said, I’m proud of you and Sara for choosing a different path and in doing so conveying your own important message. 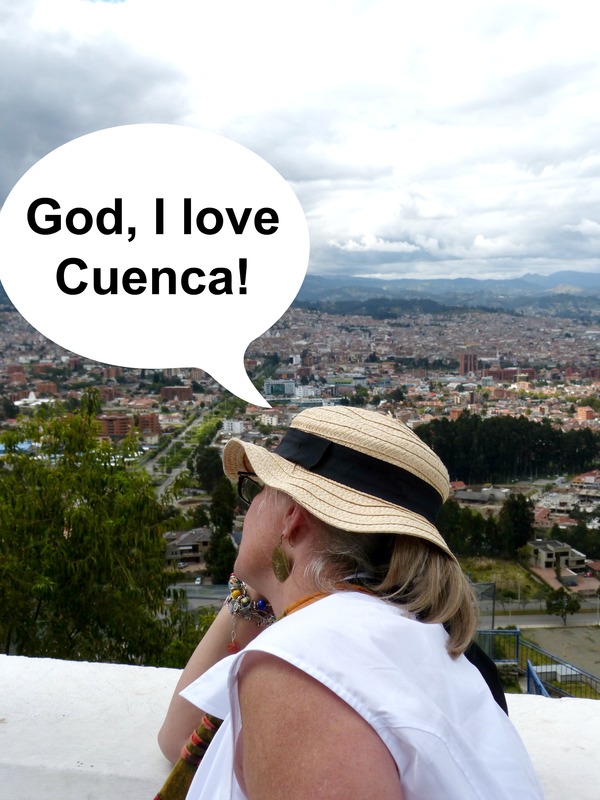 Glad that Cuenca has won over your hearts so thoroughly, too! Gosh, you’re right, Mark. It’s a mixed bag. And we know plenty of folks in the US who are conscious about the kinds of issue you raise. I know for me, however, having lived outside the US, I felt a change in myself once I had been back a year or so. I wish I knew how to explain better what it was. Maybe it was a kind of complacency. Still, you’re right, it’s the privilege of being an American that has given me the opportunity and means to make the decision we have. No easy answers. Great to hear from you, Mark. Good luck with Audrey. SO glad she’s going to come live with you. Hi Kathy, as much as we say we don’t take our privileges for granted, I think we do. South Africa is a country of extremes, extreme poverty and very rich people. Apparently, we have one of the highest geni coefficients in the world, which is the measure between rich and poor. And we do take this for granted. So many people don’t have jobs, beggars on the street are common. But it is easier to turn a blind eye. Mostly. However, there are lots of opportunities to give back, which is great. And unless you stay in your enclosed home and don’t look around, you cannot escape from poverty. A privilege, maybe? Great to hear from you, Gertie! I imagine that South Africa is a lot like Haiti in that regard. I’ve never been to SA but Sara sees similarities. I’m glad to hear your perspective. And I can’t wait to hear your story. Your post on the fire was amazing! Congrats on writing such a great piece. And thanks for stopping by. Kathy, you make me think in ways I didn’t think I needed to think. 😉 How’s that for whatever grammar laws I just broke? But I mean it. You and Sara seem to have an equal mix of courage, passion, adventure, humanity and determination. Which all adds up to an incredible life. I admire you and Sara believing in yourselves and your ideals so much that you make such a huge change. You walk the talk. Thanks so much, Colleen. Glad to be help you think in new ways. That’s great to know. And the first sentence of your comment is awesomely awesome, in a really awesome way. How’s that? Great to hear from you today. Hope you and David are doing well, staying warm, and all of that jazz. Hugs to you, too, my friend, from both of us. Tell David we said hello. I have run this story through my head today in many ways. I’ll have to send you an email. Please do. I got a few mixed responses to this post. I didn’t mean to suggest this life was for everyone. In fact, I said those exact words, but some folks seemed to think otherwise. I truly didn’t mean to indict anyone. I feel kind of bad. Don’t feel bad Kathy. If you wrote something that got such mixed responses it means you wrote something well enough to touch base and/or touch nerves with many. It just shows that as humans we do not all see the same thing-with the same perception. And you did say it was not for everyone. And the point was that this was what was right for you and Sara and you are sharing that. I’ll have to go back and read some of the other responses. Thank you, Colleen. You make an excellent point. I appreciate hearing your perspective. Hope you and David had a wonderful weekend. We did!! Fabulous weekend. More busyness coming up. You never fail to make us think. I love that about you! and this blog layout + your photos? fantastic!! OH, thank you. I had been getting tired of the old theme. I’m pleased with the larger image size. Thank you, MJ. Happy to make you think, too. Hope you all are staying warm this week. Great to hear from you. Living paycheck to paycheck in New York City where I can easily encounter a homeless person with all their worldly possessions passed out on my subway train to The Grind and then, once I step back out into the light of day, notice a fat cat behind the wheel of a Ferrari blowing by me, I’m grateful to be able to live in one of the most dynamic and diverse cities in the world, even though the poles of wealth and poverty are so acutely apparent to me on a daily basis. I’m just one person of little significance playing by the rules, treating others as I’d like them to treat me. I’m not a crusader, but I quickly give my seat on the train to someone blind, disabled, elderly, pregnant or with kids. I hold doors for people. If a store clerk screws up and gives me more change than I’m owed, I don’t take it; I point out the error. If someone drops something and I see it, I alert them. I give the time and directions (to the best of my ability when asked), etc., etc. I don’t feel apologetic about being content to live here and no, I don’t feel pampered. I’m a person of modest means. My entire rental apartment is probably no bigger than your kitchen. I’ve worn the same winter coat for seven years and only recently could afford to get new glasses. I’ve just realized that Milton is completely bald now and Coco’s eyes are blue and not green. I’ve never had an air conditioner or a microwave oven; something I’m sure you find third world of me. But I live in the place I love with great friends and tons of culture. You and Sara are more adventurous types who like to bask in the culture of other countries, but you’ll always have the privilege of being free to come and go, unlike most Americans who accept being settled and wedded to their routines. Of course, I’m happy that you have each other and together, you’re sharing bliss in Cuenca. Sara and I SO appreciate your comment, V, as you make such an important point, and one that didn’t even occur to me, sadly–that in some parts of the US, especially places like NYC, you see the same kinds of poverty and homelessness one might see in most urban centers the world over. I probably over-generalized. Didn’t mean to. In fact, it takes guts do live in Manhattan on a limited income. And, in fact, if Sara and I were to live anywhere in the US, Manhattan would be our choice. We just can’t afford it. But then that statement may belie something sad about us–that we want to live well on a very limited income, something we could not do in NY. That may say something about our own limited thinking–maybe even selfishness. I don’t know. Regardless, when I woke up this morning, the first thing Sara said was, “You need to see V’s comment. It was really, really good. She makes a great point.” And she was right. So thank you, my friend. Thanks for you blog, I have been enjoying it so far and look forward to the future to see where this goes. As for my story, I have lived in 4 countries so far and love the travel that I have done in my life. I think I have been to around 50 countries so far and I am not ready to slow down quite yet. I am Canadian and a 57 years old male. I lived in Australia for most of my adult life and moved back here to Vancouver about ten years ago. Its been so nice to be back in my home town and see the same place through different eyes. As the saying goes ” If you change the way you look at things, the things you look at change.”. I found that to be true in my case and still is to this day. I am in a good position in my life in that I can retire now if I don’t stay in the most expensive city in North America. I went to Cuenca last year and I am so glad I did. I met some folks on the expat forum and met up with them when I got there. They made me feel so welcome from the moment I got there that instead of travelling around the country I stayed the two weeks I had in Cuenca. Of course it didn’t help that I was there during the election and Marde Gras, but no regrets. I am working on preparations to make the move to Cuenca, with some luck, this year. I found that all my family has passed away and I am the last one on the planet with my blood. Its a bit of an odd feeling but in the same breath its freeing. I am still torn on whether to bring a container with me or to just let it all go and come with a suitcase. I was very encouraged by your experience with your move and not having any problems. My reason for coming to Cuenca is not just to retire but also to free myself to try new things, go more places, write, create memories, make new friends, live life the way its suppose to be, at least for me. Unlike you, I don’t have a partner and that is one of the sad things. I am sure I will find someone that might be adventurous and want to spend some time together, travel, cook share some wine, and try and find the fun things in life. I had more friends in two weeks in Cuenca than I see at home on a regular basis. I asked all the folks i met what their experience had been so far and they are all so positive and encouraging. As for Cuenca, well I was very surprised at how clean it was and how friendly folks were in spite of the language barrier. I was never once approached on the street, hustled by anyone, or even taken advantage by taxi drivers. Once I was in a internet café and it seems I over paid for my time and the lady came outside and down the sidewalk to give me my change. Walking, which is such a nice thing to do there, I felt like I was invisible and they seemed to be completely at ease with expats. Thanks for creating this blog and I look forward to one day meeting you at the expat gathering spots for drinks. Gosh, Jamie, thank you so much for your kind and thoughtful comment. It’s fun to “meet” you and learn about your situation and plan to move here. You are correct. If you don’t live in an extremely expensive city, the income you have goes further and will allow you more opportunity for adventure. And who knows. Maybe you will meet someone here in Cuenca, who would make a great partner for you. Like you, we have found the folks here, both Cuencanos and expats, to be incredibly friendly and welcoming. And we have much more of a social life here than we ever had back in the US. It’s fun, and every day is an adventure. Hope you will let us know when you get ready to move. We would LOVE to meet you and introduce you to more of our friends. I’m so glad to hear from you. Please visit my blog again soon, and let’s stay in touch! What a great way to look at it…and you’re so right! I admit, I don’t know even a portion of things that are going outside of my own little spoiled world, let alone the city, state, country, and the giant world out there! Good for you for making that choice…and Im glad you love it! Ha, ha. You actually bring up a great point, in a round about kind of way–and make me think of something I hadn’t before I read your comment. Namely, that it is actually possible to be MORE spoiled here than in the US, as luxuries like pedicures are INCREDIBLY cheap here, compared to US standards. Not a bad realization. So maybe we are more spoiled here than I realized. And maybe you are less so. At any rate, great to hear from you today, Tia. Hope your week is going well. And Happy birthday! Traveling has shown me how most of the people live in the world. it really opened my eyes and made me want to explore and learn more. living in London has broadened our horizons and we’ve met people from all over the world in this city. It’s weird when we talk about going back to the States (not something we’re planning anytime soon) and I wonder if I could adjust to it. Yes, you bring up an important point. I can’t imagine living back in the US again. I just can’t. And I didn’t adjust well during the 2 years we were back home after Haiti. It felt so not-home. It was weird. Bottom line, I understand what you’re saying. Any other place in the world you have a special desire to live? Privilege is worth exploring no matter where you are. The hard part about having a conversation about privilege is avoiding blame and recognizing that MOST people can identify some kind of privilege AND some kind of discrimination in their lives – that it is, at heart, a question of participation and scale. For instance I was talking about how heavily I lean on privilege to support my son. Orion is wheelchair dependent, has CP and autism, and needs some level of support pretty much 24/7. I also know that I actually GET a lot of the support he needs because: 1. I have the capacity to quickly grasp the medical terminology and apply it to my requests for support 2. I am white 3. English is my native tongue 4. I am sympathetic to social services personnel which makes it easier for them to be sympathetic to my needs 5. Orion is SMALL (so he is perceived as younger and more vulnerable than perhaps is true.) 6. His handicap is evident (I don’t have to fight to prove he needs support, it’s a given. The only question becomes how much support.) 7. I’m in a state that believes in providing quality medical care and support for it’s needy populations I could go on and on. I can’t tell you how many times people have come up to us and asked ME if HE talks. I can’t tell you how difficult accessibility can still be, in spite of the ADA. I can tell you that privilege is real. I just wish everyone got treated that way. WOW, you make SUCH an important point! I mean, an incredibly important point. It’s one I need to give more thought to. But yes, disability brings with it lots of questions related to privilege. I understand that in as far as I have bipolar disorder and was unable to work for more than a decade. I understand a bit about lack of parity in medical care in the US. I can’t, frankly, imagine how those issues might play out, and even more so in your case. I really don’t mean to sound judgemental. And if I did, I’m so sorry. I really only meant to talk about myself and not to imply that everyone else making any other kind of decision is wrong. I think I may need to write more about this issue and include some of the points folks like you have made in the comments, as your insights are huge–and they are ones I need to think about. Great to hear from you today, Lisa. Thanks SOOOOOO much for your comment. I’m glad it’s working out so well for you and Sara over there in Cuenco. But you’re right when you say it’s not for everyone. (Could you imagine if everyone left their jobs and homes here in the USA and all moved to Cuenco or Haiti or somewhere with a different standard of living? It would be a disaster of epic proportions.) I don’t understand economics all that well but I grasp the basic idea that we are all interdependent. When I purchase material goods I put food on somebody’s table. And even though helping hands are always needed and welcome in disaster areas, that is only true to a point, after which money is what is most needed. I think becoming more aware of how other people in this world live is essential, especially as we consider how to use the resources this beautiful planet has to offer. I also believe that living a life-style of excess doesn’t guarantee a life of happiness or fulfillment. Then I think of the areas in the world where people are without homes or food because violent power-hungry individuals or groups hold whole communities hostage and won’t allow aid through to where it is needed. There are so many things broken about human life on this planet, it can be overwhelming to think about, but I don’t think I’m ready to denounce the US lifestyle and citizens. We all have to pick our battles, or define how we want to touch the world. I think it’s super that you have found your calling and were courageous enough to follow your heart. I enjoy reading about your adventures there and learning a little bit more about people in another part of the world. Please don’t misunderstand. I denounce no one. I don’t denounce the US or anyone who lives there, by any means. This was the right choice for us. I only speak for myself and what I saw about my own attitudes during the 2 years we were back in the US, between Haiti and here. I don’t doubt that many, many people in the US are better than me, are not complacent. But I came back from a year in Haiti a changed person, and I felt my awareness slipping within maybe 6 months of being home. My expectations that I was entitled to a certain degree of comfort began to resurface. I didn’t like that about myself. However, I would still argue that there is a lack of awareness on the part of many. I think there are a lot of folks who aren’t even aware enough to know they are not aware. And I don’t think anybody really imagines there would be mass exodus from the US. You don’t really think I was espousing that, do you? That would be absurd, as you point out. Thanks for stopping by and leaving such a long and thoughtful comment. I just hope you didn’t misunderstand. I really, really don’t think this is a life that even a small minority of Americans are suited to. We need thoughtful folks like you back in places like Cincinnati. Hope you all have a wonderful weekend, Christine. No worries. And I’m not trying to say that more people here are better than you in terms of complacence. I doubt that, because I think you are right in that you often need to be there to truly understand, as you have done. My comment about the mass exodus was absurd, and was intended to be I suppose. It is just a little mental exercise I do sometimes as sort of a litmus test. Through my life I’ve often questioned our lifestyle of plenty. Should I give more money away to the poor? To some other cause? How much should I give away? What is an acceptable standard of living to expect for myself. Should I give everything away and live like Mother Theresa (which I probably couldn’t if I gave everything away because she got a lot of financial support from other people). If I did that other people would have to help me, and my parents and my children. So it’s an odd thing to think about. If everybody gave all their money away, then where would we be? What would that look like? I meant it when I said, “I think it’s super that you have found your calling and were courageous enough to follow your heart.” I’m still trying to figure it out for myself. I spent a lot of my life taking care of children and then parents. I believe that’s a worthy cause, because if I wasn’t able to take care of them, someone else would have to. I make no apologies about that. But now I’m feeling a need to be doing something. I just don’t know what. As I said above, there are so many things wrong with this world and people who need help and causes that need to be fought. I’m somewhat paralyzed by all of it. I envy you that you have found your way. Wow, that’s a great point. You HAVE spent a lot of time taking care of family, Christine. Sara and I have both had it easy in that regard. And you have had a heck of a year. And when you have children and grandchildren that changes things also, I suspect. You ask so many good questions. I wish I knew the answers. I suppose we all can only do the best the we can and what our lifestyles and personal responsibilities allow. I wish the world were an easier place to figure out. Don’t you? Hope you all had a wonderful weekend. I haven’t spoke to anyone at home in several days, but I think there was a bit of a warm-up. Take care, my friend. Thanks for the second comment. So glad I didn’t offend you!!! I posted this on facebook couple of weeks ago … think you would find the article insightful … may visit Ecuador in the winter of 2014 with a view to retire there … regards. When I check the labels on my clothes it seems to me that I do allow others to be worked to death for the sake of lower prices. Just think of what we know about third world work-shops. The sad thing is that we seem to be without power to stop participating in the madness. Great to hear from you today, George. Thank so much for mentioning Jeremy Beer’s book. Sounds fascinating. I hadn’t really thought about how capitalism builds distance between consumers and those who produce the things we consume. But now that you mention it, that makes a lot of sense. Thanks for reading and taking the time to leave such a thoughtful comment. I can’t tell you how much I appreciate it. Hope you will stop by again soon. Kathy, this is fabulous writing, fabulous post, and a must-read for every American man, woman and child. I have lived outside of the US and traveled a little, so I know what you’re talking about. I even talk about this to my colleagues and children, reminding them. Just this week, I was talking to a college student and asked her if she could ever imagine rallying students across the country to protest the government for taking our rights away, for 50% inflation, for shutting down the media. And she admitted, no. But that’s what’s happening in Venezuela and I am frightened for them. I look at how easy it is here to buy a loaf of bread, the basics. I can call and have it delivered within an hour. It’s that simple and yet it’s wrong to have so much when others suffer. Don’t get me started on reality shows. Survivor is the worst and I refuse to watch. You hit the nail on the head and I understand now why I dislike that show. Reminds me of an episode of “Curb your Enthusiasm” on HBO. A Holocaust survivor ended up having dinner with what he thought was another “survivor” but actually his companion was a survivor from the reality show by the same name. The irritating point the show was making was when the TV show “survivor” was comparing notes to prove he had it just as bad as the Holocaust survivor. How can you even compare the two. Oh, Monica, thank you. So glad this post spoke to you. I got a lot of mixed responses to this one, which, admittedly, I hadn’t expected. I know a bit about what is happening in Venezuela. In fact, every time I read more about it, I think of you, as you are one of the few Venezuelans I know. Hope your family is safe and that peace returns soon. I’m also glad I’m not the only one who dislikes Survivor. And to be honest, I hadn’t even heard of Curb your Enthusiasm,” but the episode you describe sounds downright offensive, if not immoral. Hope you had a wonderful weekend, my friend. Curb Your Enthusiasm is really a funny show. In this episode that I described I believe the intention was to show the frivolousness of shows like Survivor. That they really don’t know the meaning of what it means to survive. Surviving a “staged” challenge isn’t surviving at all. It’s show business. When pitted against a real survivor, whether it be a Holocaust or cancer survivor, the reality show survivors are bogus and artificial, with no basis in the real world. Thank you for allowing me to get on my soapbox and vent. Oh, I misunderstood. Thought it was somehow a serious pairing. Thanks for clarifying. Have a great time with your daughter, Monica. I think about how privileged I am now and then… not often enough to remember to be grateful, probably. It’s hard to acknowledge it frequently when you’re immersed in it on a day to day basis. We’re so used to constantly striving for more here in the U.S., that we forget to think about how much we have. If I had the opportunity to go elsewhere, like you, I think it would be a REALLY difficult decision. It’s hard to give up what you know. Anyway, at least for the time being, there are too many things tying me to the place and the way I live … job, family, elderly parents. But sometimes I think I’d love to be able to walk away from it all and see how others in this world live. I think you are so right, Terri. It would be difficult for most to give up the only lives they’ve known. And for many, like you, it might be immoral to leave, as I know your parents need your care and help. However, YOU made, perhaps, the greatest sacrifice one could make for another by giving your father your kidney. THAT, I think, is incredible! Hope you all managed to stay warm this past weekend. Thanks for stopping by. Great to hear from you. This piece of writing that’s straight from you heart and Sara’s too touched me. There’s so much food for thought in it. We live in the midst of abundance but are so delusional that we respond to it as if we are suffering from scarcity as we are programmed to be hellbent on acquiring more and more and more of things that matter less and less and less. There’s little doubt that the wealth and comfort we enjoy in developed nations has come from hijacking resources that once belonged to other peoples and nations but we don’t allow ourselves to admit that truth and be shamed by it. When traveling our primary concerns are focused on being comfortable in the sense of having almost all of what we left behind and that includes fulfilling desires we have elevated to the position of needs. Sadly we fail to recognize where true wealth can be found and to invest our time and energy where the valuable dividends are priceless. Without doubt, it’s our relationships with the planet and all on it that constitute our wealth. Best wishes to you two in your new home. May you always be well and happy. Thank you so much for this thoughtful comment. Yes, we have much of what we do, because we have taken resources from the developing world. I’ll admit, however, that it surprises me that more folks aren’t able to see that more clearly. It’s wonderful that you and your partner have been successful at simplifying your lives. I know it’s not easy to do, so congratulations. Thanks again for stopping by and sharing your thoughts and insights. It’s great to hear from you, my friend. I am enjoying your subject matter and the comments that its generating. I wanted to comment on the consumerism and what it does to North Americans in particular. I think about myself when I was first getting married, my parents drummed it in my head that credit was something to be avoided if at all possible. My fiancé and I bought all our furniture on lay away prior to our marriage. That set a pattern for me that is still there today. But the biggest lesson I learned, again at a young age was this. Not long after we got married and got all that furniture we took so long to pay for, we got interested in travel and both quite our jobs and we were off. We put all our newly acquired possessions in storage and headed to Asia and points beyond. Five years later we finally made it back to Canada and got our stuff out of storage. We went to locker and pulled the door up and stood there looking at what we had paid 5 years of storage payments to keep. We realized that this stuff was just that, stuff. We were so disconnected from it and we had moved on in our lives, it just didn’t matter any more, it didn’t define who we were. The furniture we had paid off had hardly been used. We ended up giving it away to our friends who seemed to have been locked into a time warp and were still doing the same things that they did 5 years earlier. That’s another blog. The advertising depicts that if we rush out and buy this stuff it will bring us happiness. We will have a great life, good looking family, lots of laughing, great friends nice teeth blah blah blah. One of our local car dealers in Vancouver will sell you the good life in the form of one of their cars, and because they are such great folks they will throw in $10,000 extra so you can holiday or pay off your Visa bill. The terms of the deal are spread out over 96 months of payments. Can you imagine? I think its hard to have perspective when you are young or perhaps not so young if you have never known anything else and consider this the way its suppose to be. Its a trap that’s easy to fall into and we see it every day. As one of your other contributors said its a hamster wheel. Its can be consuming in so many ways on our lives, relationships and I think our self esteem. I know that living overseas isn’t the answer for everyone but I find that those that choose to do it are adventurous in their spirit and are looking for more. When I speak to my friends here about my plans to move to Cuenca later this year they all seem to think its about money and living cheap. I see it as an avenue to expand myself, take complete control of my life, do the things that I am really interested in. When I was in Cuenca last year I was so busy being social I wondered why it is I am not like that in my home town. I was so surprised by the people I met in Cuenca, they had left their families and went off on an adventure, in most cases on their own. These are the types of people I think will be good for me to be around. I will finish with echoing something one of your other writers said ” we stop growing when things are comfortable and routine”. I believe that is the case for me. Love your site. I can’t begin to thank you enough for your thoughtful and insightful comment. Your furniture story is incredibly instructive. Wow. If that doesn’t illustrate a lot about what travel can do for a person, I don’t know what does. I was also really interested to hear what you shared about how social you were when you visited Cuenca, as we have found our social lives to be one of the things that has changed the most about our experience since arriving here in Ecuador. If fact, we were talking about it today at lunch with a number of other US expats. We have all appreciated the amazing friends we have made here almost more than anything. Sara and I were always social back in the US, but we could have something here to do almost every night of the week if we wanted to. Sometimes we just have to say no, as we get tired. But, gosh, what a great “problem” to have, right? Too many wonderful friends. It’s hard to beat that. I suspect you will love it here and find yourself meeting even more amazing folks once you move. Hope to meet you once you arrive. Hope you’ll stay in touch. It was wonderful to hear from you, Jamie. I agree so much with what you write here, Kathy. Americans are a spoiled rotten lot, me included, and after having lived abroad for 3 years, I yearn to go away again. I yearn for the simple life. What I especially hate here in America is the consumer culture. It seems all of life revolves around spending money and acquiring things. Most of my entertainment in Oman consisted of driving out to wadis or abandoned villages with my camera in hand, enjoying nature and the culture at virtually no cost. I’m truly shocked that EVERYTHING costs money here in the USA. If I want to go for a walk in nature, I have to pay the national or state park or botanical garden entrance fees. I know that many places in the world do have entrance fees as well, but it seems pervasive here. (Oh, with the one major exception being the Smithsonian museums in Washington – all free!). Wonderful to hear from you, Cathy. So glad you enjoyed the post. Yeah, we are a spoiled bunch. I see it in myself all the time. Maybe I will never outgrow it. Who knows. Interesting what you say about parks and gardens in the US having entrance fees. I hadn’t even thought about that. No wonder so many Americans are disconnected from the natural world and don’t understand the impact they have on the planet. I have never been to Portugal, but want very much to go. Sara and I both have a huge desire to see Spain, as well, where neither of us has been. Hope you will check out Ecuador one of these days. The cost of living is so incredibly low, it still amazes me–especially given the quality of life we enjoy at the same time. Thanks for stopping by and taking the time to leave such a great comment. Hope your week is going well. You know, Kathy, as far as those entrance fees: One thing I loved about Britain was that walkers have the right-of-way. I loved that. We could take long walks through people’s properties. Landowners must build passages, either stiles or gates, to allow walkers to get through their fences. In America, as you know, we can’t walk through private properties, which is really a shame. I definitely want to make it to Ecuador at some point. Hopefully sooner than later! I hadn’t even remembered that walkers had the right of way in the UK. I haven’t been there in more than 25 years. But, you’re right. That is really cool, and the lack of free access is a sad fact about walking the US. By the way, I will be curious to see what you think of my post today–not about expat living or Ecuador, but about growing up in an organized crime family–about the memoir I’m writing. There is AMAZING walking and hiking here, so you should definitely visit. Oh, cool. Have a great day and good luck with the job applications. Happy birthday to your husband, too! Thanks, Kathy. Still applying for jobs and waiting for luck to be on my side. Thanks, we just had a little family dinner on Wednesday, but tonight we’ll go out to dinner. You know we’ve been separated for 8 years now, but I’m hoping to reconcile. If not, who knows where I’ll be next!! Thanks for sharing, Cathy. I didn’t know any of those details. Hope you are able to reconcile! Greetings from a fellow American in Ecuador! I most definitely identify with your perspective. I studied abroad in Quito for a year in 2011, and now I am back living and volunteering at a non-profit I volunteered at called Casa Victoria. I remember the reverse culture shock I experienced upon returning to my comfortable life and sheltered college friends in the states. I’ve been to Cuenca and it definitely was one of my favorite destinations in Ecuador. I myself decided to return to Ecuador because I wanted to do something more than just make money and get a “big kid job.” I am hoping to be able to stay here for a year (or longer) but that depends on my getting a visa! Its good to hear I’m not the only one who is willing to step out of their comfort zone! 🙂 Thank you for sharing your experiences with us. How wonderful to hear from you. Sorry it has taken me a day to respond, but yesterday I did manage to check out your blog, which I so enjoyed. Congratulations on your decision to return to Ecuador. Looks like you are doing some great things with children in Quito. Keep up the good work. Hope you get the visa you need. And please stop by again soon. Thanks for reading and taking the time to leave a comment. I agree with you Kathryn: just so easy to forget or ignore willfully the tougher situations that others must live daily. I have immigrant parents with high school level education (mother gr. 10) and father finished high school in the early 1940’s when China was spinning into civil war internally and with the Japanese. It is my working class, income parents and my childhood upbringing that keeps me rooted in reality even though unlike them, I am child-free, first generation to be university educated and earning a middle class income as a professional. Though I was born in Canada and lived all my life in Canada, I know first-hand the immense struggle of learning English by immigrants…..because I didn’t learn English until kindergarten. The shock of kindergarten was great to me…and I did take some extra ESL classes in school. That’s how narrow and protected I was as a child in Canada. My mother still has very limited English understanding with her children who have lost 80% Chinese speaking fluency. Maybe one day I’ll blog about growing up in a 1 bedroom apartment with 5 children in southern Ontario…before we moved to our lst house with 6th child… We have been that poor. Wow! What a great comment, Jean. YOU really have lived a challenging life. I had NO idea. It’s interesting to hear about your advocacy efforts and living with so large a family in such a small apartment. Gosh, I hope you will blog about it–or maybe write a memoir. Sounds like you have an amazing story to tell. Thank you SO much for sharing a bit of it here. I feel honored to know a bit more about you. Again, THANK YOU! Fascinating. I had DO idea! Kathy, thanks for this thoughtful post. I don’t think I’ve ever taken for granted living in the U.S. I am have always been thankful that I had the good fortune to be born here, to live here and to grow up in a middle class family. Now, with two of my neighbors having to move because they couldn’t afford heating oil this winter, I have even more to be thankful about for now, close to that edge as I am. I still think about Cuenca, and at least visiting. When I can work out a trip I will certainly let you and Sara know. Currently, it’s not in the picture; but who knows? Miracles happen. You are blessed, but I can only imagine how folks are paying to heat their homes this winter. We could never have done it. Let us know if you decide you’d like to visit. We’d love to have you. Hugs, hugs, hugs! And stay warm! Aaahh, I feel more at ease just looking at those words again. Maybe it’s just me? Wow, Dana, THAT is a powerful quote! I think I’m going to write it on an index card and put it on my mirror. It’s interesting to know that you, too, struggle with similar feelings. It also interested me to see the wide range of responses I got on this post. Wonderful to hear from you, my friend. And congrats on your new home! Believe me, I understand. I had never heard it before, so I’m thrilled! Thanks again. I agree with Dana, provided we live out lives that prove to be an advantage to those sick and poor. But do we? My impression is that we sadly exist in a fog of apathy, where we feel litle of connection.or concern outside of our own small circles. Great point, and an important insight, George. I wish most of us had less apathy. Wouldn’t the world be a better place then? Thanks so much for your comment. It’s wonderful to hear from you today! Kathryn; From reading the comments here and your responses I feel compelled to acknowledge the effort you put in to answer everyone who has posted. You have a talent for encouragement that should not go unoticed. Thank-you. George, thank you. You are a sweetie to notice, let alone mention this. You clearly have the same inclinations. Hope you have an awesome weekend.